Magical Blogorail: Favorite Disney Snack! When it comes to Walt Disney World, one of the first things I think of is the wonderful food that you can enjoy! So when Amy from Growing Up Disney told us she wanted to talk about our favorite Disney snacks, after my stomach stopped growling, I immediately started to think about what my favorite snacks are! Today is exactly 7 weeks (49 days) until we arrive at Walt Disney World for our next vacation, and I am so ready for it to be here! This is a special trip; like last year when we were able to go with my sister-in-law and her family, this year we are going with some wonderful family and friends, and we have purchased the Disney Dining Plan to help us enjoy all that Disney has to offer! When it comes to snacks, there are so many incredible things to enjoy that it’s hard to decide which ones are the best! For me, it all comes down to the situation; the time and place makes a big difference in what snack I want. For example, in June 2010, when we were settling down to watch the Main Street Electrical Parade, everyone wanted ice cream from the Plaza Ice Cream shop — except me! For me, the perfect parade food is simply a nice box of popcorn from the vendors in Town Square, and a Diet Coke. You can’t go wrong with that, well, at least, I can’t go wrong with that! I have been blessed with being able to go to Disney World with my family on many occasions. Perhaps because of this, I don’t know that I have a single favorite snack, but I do have a lot of them! One look at my stomach and you’ll know that is true! Since I can’t decide on just one, I thought I would mention some of them, where you can find them, and what makes them special to me! Beignets can be found at the Sassagoula Floatworks Food Court, located at Disney’s Port Orleans French Quarter! They are incredible, and I remember getting some and walking back to our room with them for an early breakfast. Peaceful, relaxing, that is POFQ! Located at the Main Street Bakery, one of my favorite snacks is a big ol’ Cinnamon Bun! Yummy, gooey, tasty, you name it, that is what it is! Not all of my favorite snacks are breakfast items. When it comes to ice cream, I love the Mickey Premium Ice Cream Bar — although not as much as my wife does! Although I’m betting that all of you know this, the bar is simply vanilla ice cream, shaped like a Hidden Mickey, with yummy chocolate on the outside. Simple, but incredible! In addition to these, I also love the Jumbo Turkey Leg! Located all over the parks, these things are huge, and can easily be shared! I know that some people don’t think they are good, but to me, they are incredibly delicious! 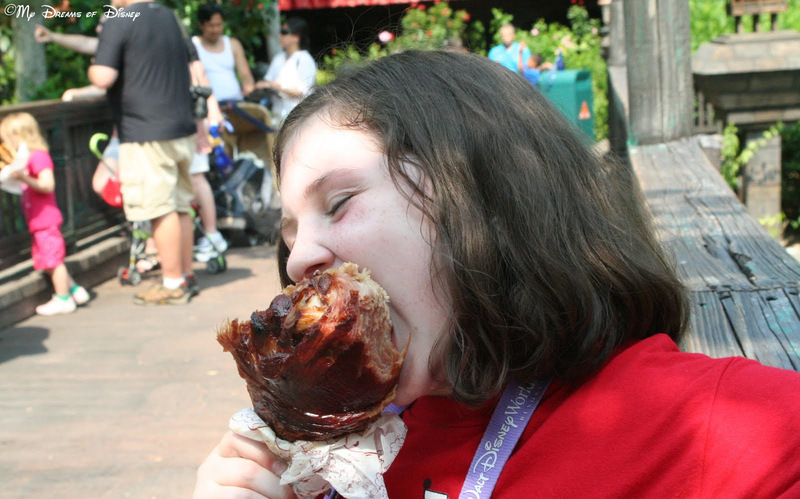 Finally, in closing, here is one of my favorite photos — Sophie enjoying the Jumbo Turkey Leg! There are so many other delectable treats to enjoy at Walt Disney World, but I’m kind of boring when it comes to my snack choices. What are your favorite snacks to enjoy at Walt Disney World? for joining me today. Your next stop on the Magical Blogorail Loop is A World View.